There are lots of ways to tell a school’s story. 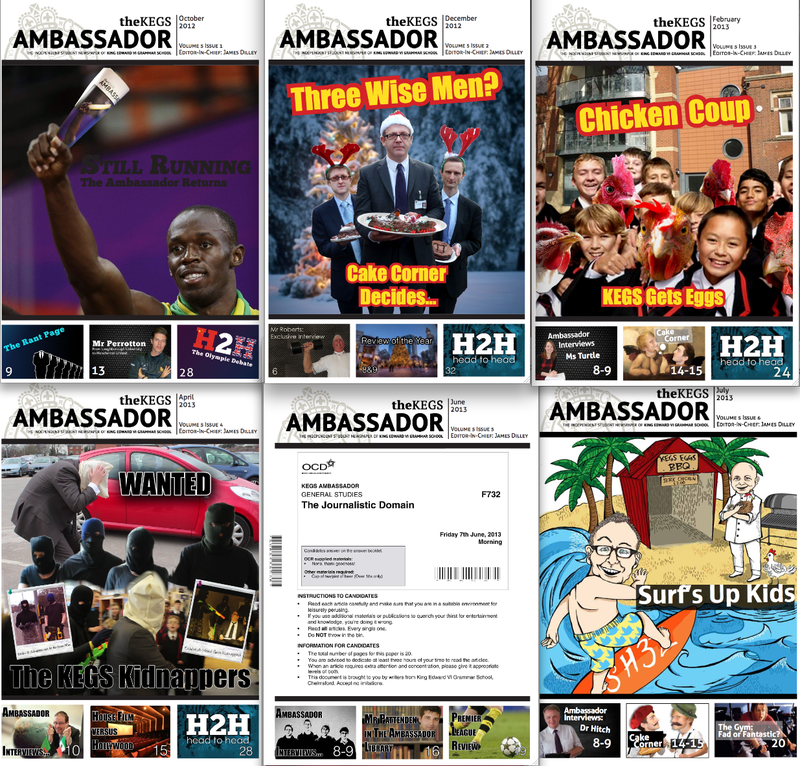 For us, one way would be to read each issue of the students’ own newspaper. The full archive is here. 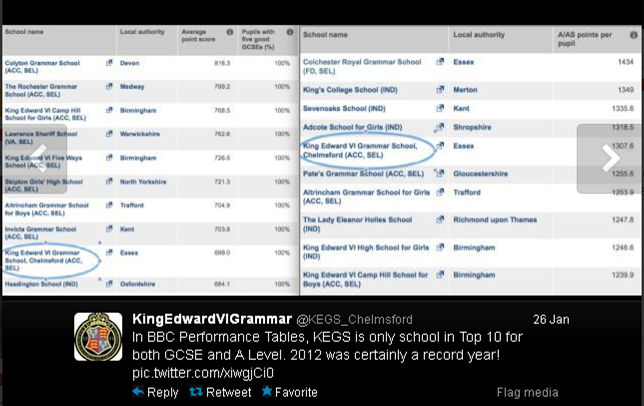 Another way would be to look at the photos from our @KEGS_Chelmsford twitter feed. (The link takes you to the photo album – well worth scanning down.) So many characters, incidents and moments of magic. That’s the joy of school life. I love being a Headteacher for many reasons and, this year, I’ve had plenty of moments when I’ve had reason to feel that KEGS is a wonderful wonderful place. This post is a record of some of those moments….. 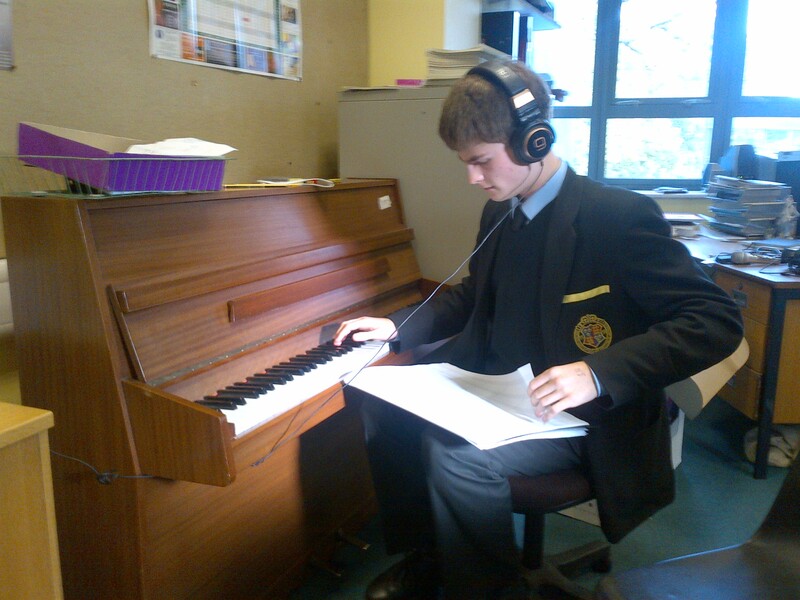 Teaching: Co-construction with Y11 and my final lesson with Y13 watching Commander Hadfield sing Space Oddity. Teaching two exam classes was a challenge but one that I loved. My explorations with co-construction have been an interesting feature of teaching my Y11s but, above all, I’ve simply enjoyed their company and their enthusiasm for learning. Let’s hope the exam results do them justice. Similarly with my A level class – teaching them was the highlight of every week. Our final lesson featured Commander Hadfield singing from the ISS: one of those off-piste moments where, even with exams on the horizon, something current demanded to be shared. A GPR Masterclass; a fabulous History lesson. Watching other people teach is a special privilege. Many of my colleagues leave me in awe with their knowledge and skill. Here, watching my colleague Mark Barrow teach the Pre-U Global Perspectives course is like a masterclass in questioning and rigour; on the right, is a Year 9 History where extended writing is the end-product of a string of interactive learning activities that probe and explore in real depth. Stunning. Earlier in the year I wrote about the joy of working with the Art Department in this post: Lessons from Art Lessons. House Drama: Student leadership and talent makes for great entertainment. House events at KEGS are a real joy. House Music was possibly the best one yet… I wrote about it in this post. House Music: The KEGS Spirit in Action But House Drama was also excellent. Students of all ages expressing themselves in an event that is student run. On the right the ‘8 Angry Pigs’ mirrored our official production of ’12 Angry Men’. Wonderful stuff. KEGS Eggs. A student initiative…with a distinctive KEGS flavour! KEGS EGGS…A student project conceived, planned and delivered. I am delighted to be on the list for regular deliveries. Sadly four Hens soon became three, but that’s all part of the learning! Student-led assemblies were a highlight of the year. These two examples were superb. A series of heated head-to-head mock-Presidential debates brought the US election to life for us all and the Black History assembly was as much a celebration of culture as a reminder of the politics of Civil Rights. What I loved is that all these students put themselves forward; they wanted to do these things so they happened. We didn’t need to ask. KEGS MUN; now a well-established part of school life. Model United Nations is no longer news at KEGS. That’s why I’ve included it here; we’ve reached the point where MUN is an embedded feature of school life with all Y8s, Y10s and Y12s having their own event alongside some additional weekend conferences. We even have table flags now! This is Azerbaijan ready for action. The issues are tackled with real zeal and focus and the conference leaders – the Secretary General and committee chairs – do a fabulous job of making it enjoyable and serious at the same time. Our China links have gone from strength to strength. I wrote a little about my Easter trip to China in this post: A Chinese Education. 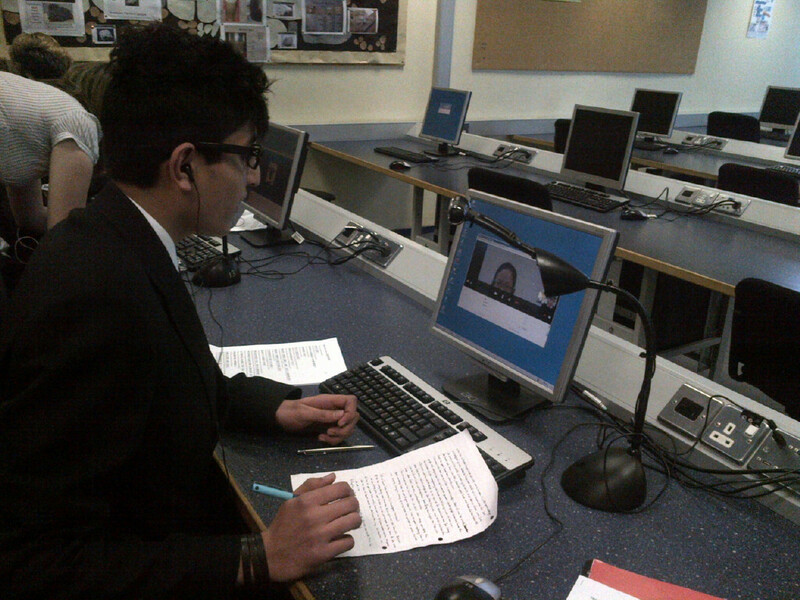 The photo shows one of our students engaged in a skype session with one of his counterparts at Wuxi No 1 High School, our partner school. This Friday morning exchange has now happened successfully several times…. another thing we dreamt might happen that has now come to life. The KEGS Global Blog Challenge; three of the finalists. The Global Blog Challenge was seized upon by over thirty groups of students. In the end, only about 15 students sustained their blogs throughout the year but the best were extraordinary. The PitStop Blog led to a student receiving offers to blog for commercial F1 sites and the finalists all reported having gained a lot from the process. Sports Boggle had over 20,000 hits from over 130 countries. The final 12 can all be seen on this site. 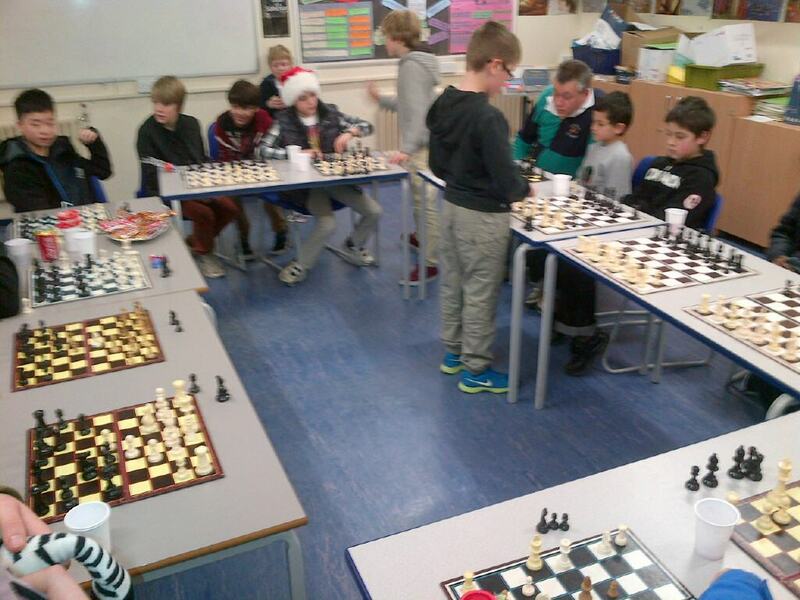 Y7 Chess Wizard Daniel in action playing 12 simultaneous matches – and winning. We have a lot of very talented students but, even in the selective KEGS context, we have to marvel at just how exceptional some students are. One of our Y7 students, the reigning U14 Essex Chess Champion recently returned from playing chess for England U14s in Serbia. Here he is taking on all-comers at the Christmas Fair. My attempt at ‘fool’s mate’ was given short shrift! Gifted musician Ben tweaks the score a little more..
A personal highlight of the year was working with some fantastic KEGS musicians and singers – Ben, Josh, and Max – who helped record a piece of music I had written. I wrote about this in a post earlier this year: Song for Venus: Sola Vida which includes the final version for your entertainment! I enjoy setting occasional assembly challenges. 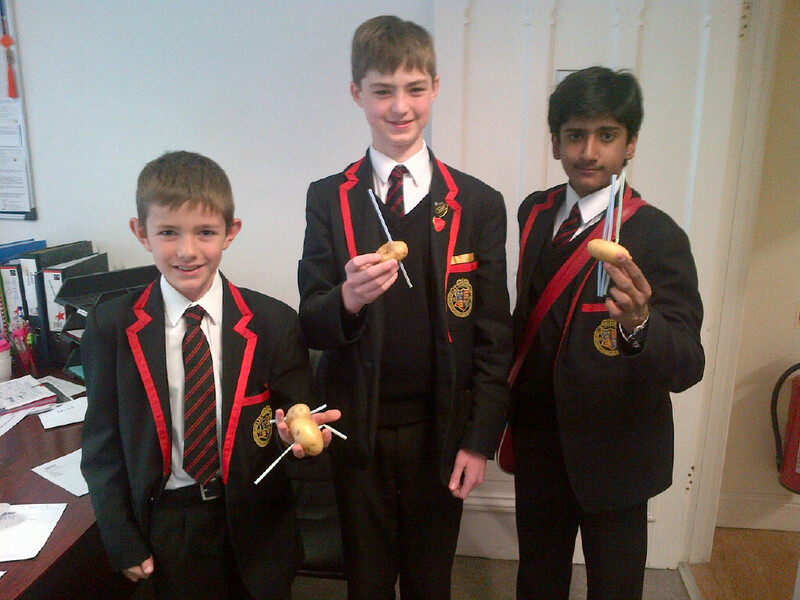 Pictures are three boys who arrived early to school to show me that they had succeeded in getting a straw through a potato. Another one that generated a stream of students visiting my office (until someone finally cracked it) involved working out the number of seconds between 12:12:12 on 12/12/12 and 01:01:01 on 01/01/01 (2101). I love the enthusiasm these things generate. One student – pictured here on the left – succeeded on both challenges. The CCF is part of the KEGS tradition that dates back over a hundred years. 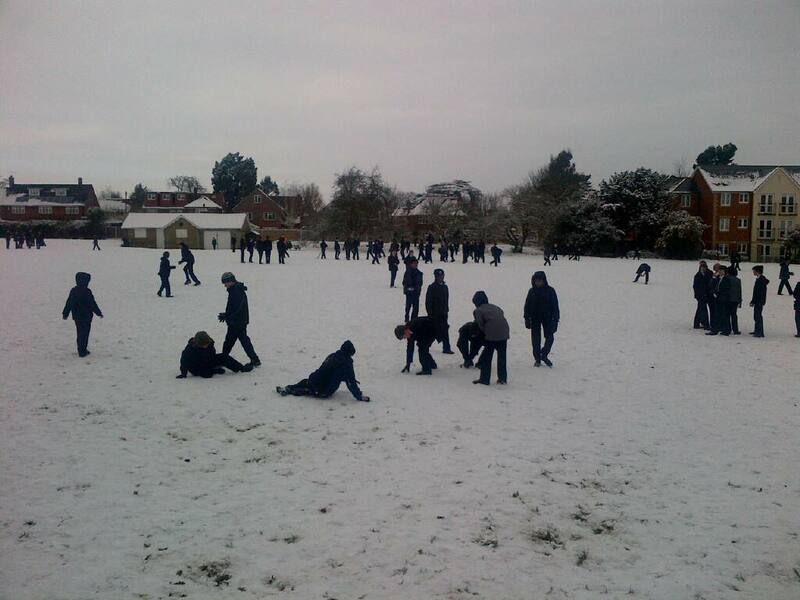 We have (I think) the biggest state school CCF army contingent in the country with well over 200 cadets. Most of the time you wouldn’t notice, but come to school on Mondays and you see a sea of students in green combat uniforms. The leadership opportunities are extensive along with all the camps and skills training. Here the Biennial Inspection was an opportunity to showcase all of their activities. The peer-to-peer training in the CCF was the inspiration for our student-delivered IT programme Project 9, as featured here. Charities Week… five days of mayhem. Charities Week: A fairly chaotic week but one that is done with great spirit. This year seemed especially good – although I was kidnapped in the middle of the week and taken to a carpark and dumped from a car. All in a day’s work. Here the trolley dash (with Easter snow behind!) is shown along with one group of students who auction their services to a lower school form for the day. School photos are fairly dull in theory… but I always enjoy the process of getting everyone into a large panoramic shot.. even though they stitch it all together from three separate vertical tiers. This old picture was given to us this year.. times haven’t changed that much. Visitors: Alex Dowsett for Prize Giving; Larry Eldredge for a Latin workshop. We’ve had some great visitors this year. Highlights for me were the attendance of ex-KEGS student Alex Dowsett, now an international cyclist for Movistar and winner of a Giro d’Italia stage. He gave our prize-giving speech – probably the youngest person ever to do so – reflecting on how he’d turned adversity (living with haemophilia) into triumph. Students found him truly inspiring. I also enjoyed the visit of my step-dad Larry, a retired professor of medieval Latin who come in to deliver a workshop. He shared a poem that he described as “the most beautiful poem in any language ever”. It is featured in this post about ‘Awe’. These days we don’t seem to close on Snow Days. We try to enjoy them. The Adverse Weather day structure helped us get through this year.. and the snow seems to raise spirits, despite the transport drudgery. The annual school magazine is always a great way to capture the school year. 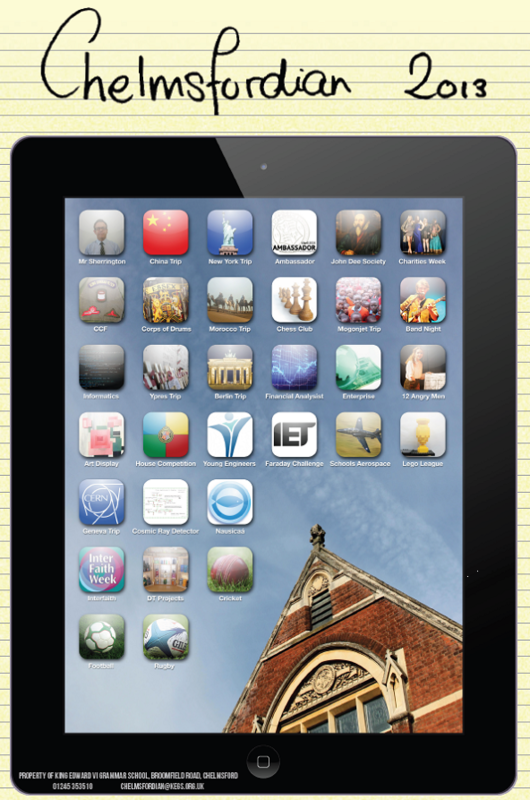 This issue uses the ipad theme to great effect. On-line, the icons work as hyperlinks to the relevant sections. The cover also captures a key feature of the year where over 35 teachers have received ipads and have begun to explore the possibilities. I can’t live without mine now: it’s my register, calendar, notepad, camera, browser… and I’m still just a novice. We don’t buy into all that false futurama stuff about teachers becoming redundant, but, certainly, mobile devices have a future in supporting what we do and we’ve embarked on that journey. I can’t resist putting this in – just because I can, at least this once. Exam results are not our only means of measuring success but, amid the turmoil of league table highs and lows, it was pretty exciting to find we were the only school in the top 10 on both lists for GCSE and A level by average total points. It probably won’t happen again… and obviously it depends on what you measure and where your students start from …but when it works in your favour, you want to enjoy the moment. I did. Thanks to all the students and staff at KEGS for making this a truly memorable year. Fortiter Ex Animo! I never get tired of that. A fascinating insight into a year at KEGS, thank you. I was particularly intrigued by the 1947 school photo. Do you have others? My father John Leonard Denton, who passed away when I was just 10, attended KEGS between 1960 and 1968 and I would love the opportunity to see some photos from that time. I can tell you are a one of a kind teacher who feels real passion for teaching. Congratulations.